A big thanks to all who came out yesterday and attended my presentation in the B&H Event Space. Since we had more attendees than handouts, feel free to access and download the material by clicking here. The Basic HDSLR Editing video is now available for those who have purchased the Beyond Stills e-Book or have attended one of the Lo (cal) Motion Workshops or Beyond Stills workshops at Calumet Photographic in NYC. The tutorial walks you through the creation of a project from import to export, and viewing the finished production. While I use several video editing programs, I chose Corel’s Video Studio Pro X3 software for this tutorial. Keep in mind that the brand of software used for the tutorial is less important than the concepts outlined, as virtually all video editing software works by dragging and dropping selections on to a timeline or on a storyboard. One of the reasons that I chose to use the Corel software for the tutorial was that the built-in music and sound library made the addition of these elements to the “video making” demonstration process seamless. Please note that the Premium Content is password protected. If you purchased the book through ibooks, please ocontact me at info@theimagician for your password. If you want to check-out the book, click on the e-Book tab above. The e-Book Beyond Stills: HDSLR Motion Capture for the Non-Filmmaker is now available for purchase here on this site or as an iBook for direct download for iPhones and iPads from the Apple iTunes Store. Click here to read more. 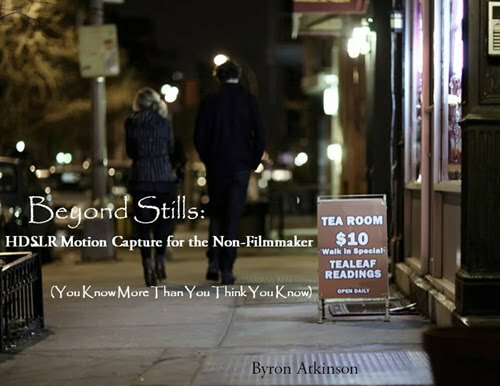 My e-book, Beyond Stills: HDSLR Motion Capture for the Non-filmmaker (You Know More Than You Think You Know) and the companion Beyond Stills—Interactive Resource Guide will both be available later this month. Availability and additional information will be posted soon. Hi! Welcome to Beyond Stills!